As this mystery begins, Alleyn is travelling on a train in New Zealand. He is on vacation, and happens to be sitting with a group of actors – The Carolyn Dacres English Comedy Company – on tour. Alleyn is dozing off as the train moves through the night, idly noticing the eccentric characters surrounding him. But when one of the company feels an attempt has been made on his life, Alleyn finds himself on a busman’s holiday, as he’s recruited to try and assist in the investigation. I wouldn’t say this was my favourite of the Alleyn books that I have read so far, but it was still very good. Marsh’s great knowledge of actors and the theatre shows here, with her funny, detailed, and poignant descriptions of all of the actors. There are a number of references to a previous Alleyn novel that involved actors, Enter a Murderer, and one of the characters from that book is in this one as well. This is the first book in the series set in New Zealand, and one of the main characters, Dr. Rangi Te Pokiha is a Maori. He plays a pivotal role in the plot, and explains a tiki – a Maori fertility symbol – which also has an important part to play. As well, there are a number of scenes where the beautiful New Zealand landscape is vividly described. There was a scene that I found very interesting where Alleyn talks with one of the New Zealand policemen about the possibility of another war. It really brought home the time in which the book was written, 1936. I liked watching Alleyn politely and deftly interact with the New Zealand police, diplomatically assisting them while trying not to step on their toes. It’s a pleasure to read about such a sophisticated man who misses nothing. One of the mysteries is whether poor Alleyn will ever end up getting any vacation time. Andrea Thompson is a booklover from Ontario, Canada, who has a particular penchant for Golden Age mysteries. I love the good bits of this book - the train, the picnic, the manuka trees - but am put off by some cruel humour at the expense of the fat policeman. I feel the suspects are made to come on and do "turns", and find the drunkard who spouts Shakespeare very tedious. 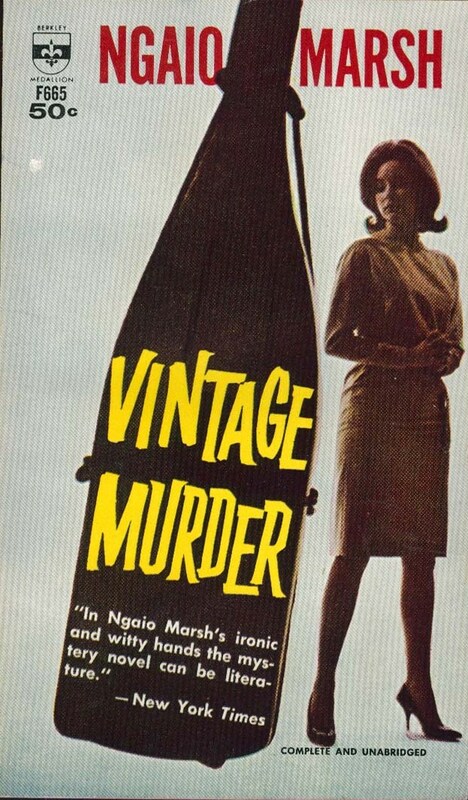 I've just finished listening to Enter a Murderer and it sounds as if Vintage Murder is very similar, although the New Zealand setting gives it an extra nuance. Glad you liked it and I may now give it a read.